Saflec Systems has recently released Version 3 of our SACS Standard Edition, SACS Professional Edition, SACS Corporate Edition, SACS Client Edition, SACS Estate Assistant and SACS Personnel Assistant to the market. All development or integration on the SACS Version 2 editions has been stopped because the SACS Version 2 editions were developed in C++ / Visual Basic and the new SACS Version 3 is developed in Dot Net. SACS Version 2 will only be supported until the end of the second quarter of 2018. We recommend that you upgrade your software during this period. There will be a once off upgrade cost to upgrade from SACS Version 2 to SACS Version 3. The upgrade costs are listed in the latest SACS Retail Price List. All Version 2 applications that were bought in 2017 will be upgraded at no additional cost. In addition to the new look and design, the new SACS interface is scalable which allows you to design the dialogs according to what you want to see, either on a single monitor or multiple monitors. Visitor self-help enrolment module for SACS PA whereby the visitor can either enrol their finger or receive a pin to access the pr emises. Virdi’s new “Plus” range of biometric hardware is integrated and requires the latest Virdi Plugin for SACS Version 2. The latest plugin is part of the SACS Version 3 installs. Morpho’s new biometric Sigma range is also integrated and requires the latest Morpho plugin for SACS Version 2. The latest plugin is part of the SACS Version 3 installs. This plugin also requires the correct Ident and Verif licenses. Please confirm with our support department if you are not sure what licenses you require when you add new Sigma readers to your existing system. All Windows 64 bit operating systems requires the Verif license for the MSO enrolment reader. This includes SACS Version 2 and SACS Version 3 installs. HID Mobile Access Portal for Mobile access control with NFC and Bluetooth technology. Employee and Visitor management options available. Configurable reader protocols on controllers. All legacy series 2 and series 5 controllers will be compatible with the new Version 3 software. Some of the new Version 3 features will not be available in the legacy 5 series controllers (EOL 2015). Did you know that we offer an Installer / Operator refresher course on a weekly basis? This will assist your staff or your client’s system administrators in getting more familiar with the new look and design. Please contact Saflec Systems on training@saflec.com for more training information. You can also follow our Facebook and LinkedIn pages for more regular product updates. 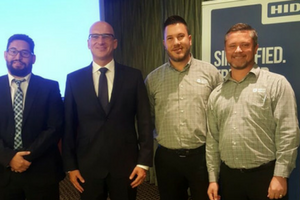 Allen Coetzee and Barend Keyser from Saflec Systems attended the recent HID Partner Solutions Seminar that took place at the Hyatt Hotel and Conference Centre in Rosebank on 4 July 2017. Imagine a world where access fits in the palm of your hand. HID Mobile Access can be found in a variety of products offering mobile connectivity. The same device you use to open gates and doors, can allow you to log onto the network, open electronic locks and securely release documents from your printer. You can also use this same device for time and attendance, to get a snack from the vending machine or access the electronic vehicle charging station. HID Mobile Access is connecting the environment like never before. IT security and facility management can now move toward consolidated access programs. The efficiency and potential cost savings gained through centralised access management is becoming more attractive to organisations as they are asked to do more with less. HID Mobile Access is leading the way with mobile solutions that support the needs of today’s organization in a mobile first world. From left to right: Robbie Truter, Regional Sales Manager HID Global, PACS, Jaroslav Barton, Security Solutions HID Global, Allen Coetzee, Saflec Systems Sales Executive, Barend Keyser, Senior Sales Manager.